Whenever I tell a patient that they have cataracts and start discussing surgery, many always ask “Is the surgery done with laser?” Until the past year, I would say no, it’s not laser that removes the cataract. Since the 1970’s, cataract surgery has been done withphacoemulsifcation, or ultrasound power to break the cataract into tiny pieces. Phacoemulsification utilizes the same ultrasound that dentists use to clean your teeth and was actually developed by Dr. Kelman at the Manhattan Eye, Ear & Throat Hospital where my husband and I trained, met and fell in love (a subject for another post). However, at the end of 2011, the FDA approved the CATALYS Precision Laser System, a next generation laser cataract machine. Earlier this year, my husband, Dr. Jeffrey Wong, became one of the first cataract surgeons in Hawaii to offer laser cataract surgery with the CATALYS. Using CATALYS, he can provide a gentle, highly customized cataract procedure with precision not achievable with traditional manual techniques. Every eye has a unique size and shape. CATALYS’ advanced 3D imaging technology builds a 3D map of each eye and tailors the treatment to that map. This enables the surgeon to create a customized treatment plan that matches the uniqueness of each eye. Using the manual technique without the CATALYS machine, my husband would have to use the instrument pictured below along with the ultrasound probe to break the cataract into many pieces. Again, in experienced hands, this technique often results in perfect 20/20 vision, but it does require additional ultrasound power. With the CATALYS machine, since the laser divides up the cataract, the ultrasound power that is used to remove the cataract is less, which is better for the overall health of the eye. 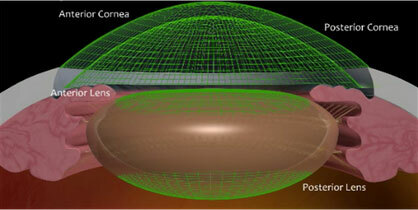 Depending on the patient’s pre-operative vision and desired visual result, Dr. Wong, or whoever your cataract surgeon is, may recommend a tailored treatment plan that could include creating ultra-precise laser incisions in the cornea and a specific clear lens type, such as a multi-focal lens. This tailored treatment may reduce a patient’s need for glasses or contacts after surgery. What are the benefits of Laser Cataract surgery? What is a patient’s experience like with CATALYS ? Patients like on the bed and the surgeon “docks” the machine on to your operative eye. Then, he or she will enter the parameters into the machine and guides the machine in making the laser cuts for the capsule opening and sectioning the cataract into pie pieces. Then, the patient is taken to the operating room, where the surgeon will use the phacoemulsification probe to completely remove the cataract and insert the artificial lens. One of the first patients, a nurse at Queen’s, who my husband performed laser cataract surgery on in the summer, was kind enough to record her experience. Last year, I had the conventional cataract surgery done on my right eye, by Dr Jeff at Queen’s same day surgery. My pre and post op recovery was uneventful, painless, and successful. This year, for my left eye, I chose to the computerized Optic procedure and the newest Laser Cataract Surgery with CATALYS. Nervous? No, not at all. I had already researched on line, decided that the Laser Cataract Surgery with CATALYS, would be the most precise and present the fastest recovery. Preoperatively, Dr Jeff thoroughly explained the procedure, and I was ready! The morning of the surgery I arrived at the Surgical Eye Center, was warmly greeted and the preop procedure were started. The Surgical Eye Center has a very relaxed atmosphere. The staff was friendly, informative, very attentive and efficient. I barely felt the IV start, and appreciated the fact that I did not have to change out of my clothes into a surgical gown. What I was unprepared for, was how painlessly simple the whole procedure would be! I was taken to the room with the Catalys machine, and lay comfortably down on the table. Dr Jeff explained each step by step of the procedure. I was instructed to focus on the “red light”…and for me this became a light show and a kaleidoscope of red scales and textures. I was mesmerized by the moving lights! After a few seconds (or minutes, I am not sure) a beautiful green light branched out like tiny capillaries, covering the red scales. Slowly all of the lights and colors faded, and I was assisted to sit up and walked back to the gurney. I was really amazed! I do not remember very much of the second part of the surgery which was the lens implant procedure. It maybe the effects of the fentanyl or versed, but I think I was still thinking about my “personal light show”. The whole cataract and lens implant took less than 10-15 minutes.I went home, took a tylenol and watched netflix movies! By that evening I was already on the computer checking emails! The next morning I was able to drive to the Honolulu Eye Clinic.Today, I still find myself staring at the leaves of trees and at plants and flowers, as colors are brighter and more vibrant. Post operatively, and I continue to notice that my vision is sharper and I am able to see things more clearly. The world is really beautiful! This was amazing! Thank you Dr Jeff! If you are interested in learning more about laser cataract surgery with my husband, Dr. Jeff Wong, in Honolulu, please contact us at Honolulu Eye Clinic at 526-0030 or via email: ronnie@honolulueyeclinic.com and speak with our Surgical Coordinator, Ronnie Bradbury.